We came up with a game to start recognizing word families. My 4 1/2 year old son has begun recognizing a few words. These are words he sees often, and he lights up when he comes across “dog” or “big” or another word that frequently appears in our books. He asked me if he could do a “reading” activity. I was a little hesitant, because I don’t want him to feel any pressure to learn to read – he’s only 4, so he has plenty of time. But then I thought that if he is associating learning to read with fun, to the point where he is actually asking for these activities, I should go with it. He has recognized several words that end in “at” and “all,” so I wanted to build an activity that centered around those words. Reading is hard. He knows that; when he opens a book he is continually confronted with letters jumbled together, from which he is only starting to decipher individual words. I purposefully made this activity pretty easy because I wanted him to experience success. Supplies: blue paper for raindrops (I used Post-it notes), paper for buckets, tape, a marker. Setup: We played with 2 word families: -at and -all. I cut out 2 buckets in different colored paper, and wrote “at” on one and “all” on the other. 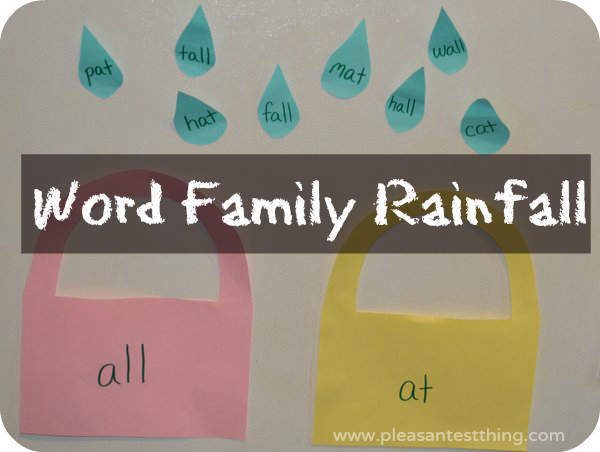 Next I cut out 8 raindrops out of blue and labelled each with a word from either the -at family or the -all family. I put the raindrops in random order on the refrigerator and taped the buckets under the drops. Then I called my 4 year old out to the kitchen. He looked at the fridge and exclaimed, “I know those words!” I asked him if he could read the words on the bucket (he did), and then explained to him that we were going to put the words that end in “at” in the at bucket and the words that end in “all” in the all bucket. Before he placed the words I asked him to come up with as many rhymes for “at” and “all” as he could. I thought saying those words might make it easier for him to recognize them written out. As he came up with the rhymes, I showed him the corresponding word on the raindrop. This part didn’t go as smoothly as I had hoped, because he was very anxious to get to the game in front of him! He had fun putting the drops into the correct buckets. He sometimes put them on top of the buckets, and sometimes he slipped them behind the paper buckets, so that they were actually “in” the bucket. What’s wrong with this picture? : He also liked playing a version of the game where I put the words onto the buckets, and included one wrong word in each bucket. He would then spot the incorrect word, and put it into its proper bucket. 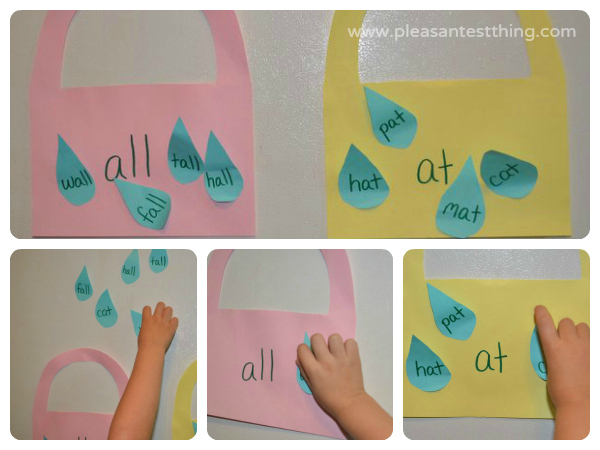 Additional Buckets: For kids who are more advanced in their reading skills, you could add additional buckets, including some words that don’t fit in the buckets for an extra challenge. You could also have them read each drop as it went into the bucket. We didn’t focus on that as much, because I wanted to keep the activity very low pressure. Dolch Sight Words: The Dolch 220 word list is a list of words that appear frequently in the English language, but which may be hard to “sound out” – such as “laugh” and” the.” There is an additional Dolch list of 95 frequently occurring nouns. Of the words I used in this game, only “all,” “at,” and “fall” are on the Dolch list, and “cat” is on the noun list. A game could be developed using Dolch words, for instance, a color bucket, with rain labelled “brown,” “black,” “blue,” and “red” (all Dolch words) and another for numbers (two, three, four, seven).